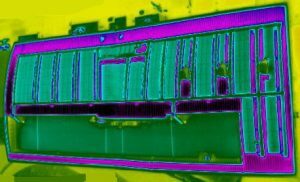 Home / Posts tagged "Thermal Survey"
IRT Surveys are fully trained and Qualified to undertake infrared BREEAM surveys with regards to continuity of insulation, heat loss and thermal bridging; in order to conform to the BREEAM accreditation process and BS EN 13187 Standard. Our client asked us to survey his new build exhibition centre property in order to gain BREEAM points under the scheme. The IRT thermal survey pinpointed 4 regions of deficiency in the building fabric at door detailing and suspected missing insulation. Our reports use clear thermal and visual images along with analysis in plain English. This allows building owners, contractors and non-specialists to understand the issues quickly and see the problems. 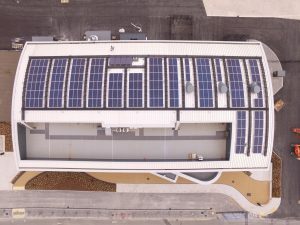 The follow up thermal survey, after remedial works, found all regions in excellent thermal condition allowing the building to gain an extra credit and help achieve a BREEAM Excellent rating. You can achieve an additional BREEAM credit for your project by having a thermographic survey carried out on completion by a professional thermographer holding a Level 2 certificate in Thermography. IRT offer a nationwide service providing consistent surveying and reporting from ITC qualified staff. 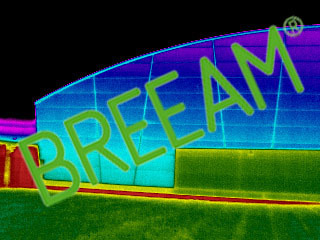 A BREEAM Survey requires a survey of the entire external envelope (roof/walls) and in some cases, the internal envelope between conditioned and unconditioned spaces. • Continuity of insulation in accordance with the construction drawings. • Avoidance of air leakage paths through the fabric. • Detect small issues before they become much bigger. Any anomalies detected can be re-surveyed and analysed once remedial action has been carried out. After survey completion; images are uploaded to our head office to be evaluated by our analyst team for roof defects. Our upload system allows for instant handover from surveyor to analyst and fast turnaround. The completed report will be available to the client within 5 working days. A full colour PDF format report will be uploaded to our secure server and a link sent to you for instant access to your results. Our reports are designed for readability and understanding. Each page of the report includes a thermal and visual image with corresponding location plan. The primary building plan indicates which page you can find analysis for your chosen section.